Overlapper is a visual analytics tool that incorporates different visualization techniques, besides the core force-directed graph, such as: scatterplot, parallel coordinates, treemap and tag cloud. 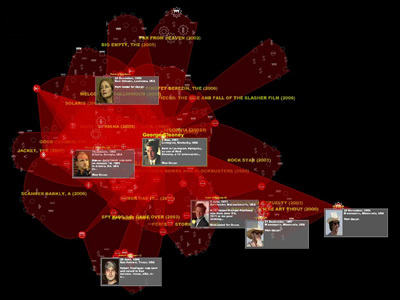 The tool focus is in very connected groups of people and their overlapping between different social networks (such as movies). Overlapper was developed using a modified force-directed graph representing people as nodes, where all the people involved in a particular movie are joint together in a kind of bubble. 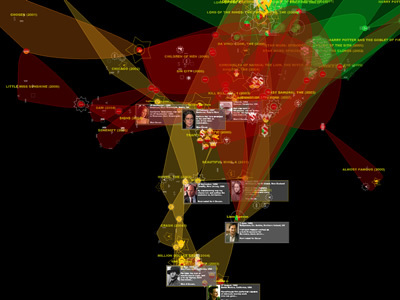 Since the tool allows several movies to be mapped in the same space, the resulting environment is a large set of bubbles interconnected by people involved in more than one movie. Two important drawbacks of graph visualization are complexity and cluttering. In Overlapper, complexity is reduced by selecting only interesting subsets so only relevant information is displayed. Also, the authors used two edge models: the complete model, which join together all nodes of each film, and the radial model, which connects each person node to a central node representing the movie, reducing edge complexity. To avoid cluttering, edges are not drawn. Instead, transparent hulls group people who have been involved in the same movie. The tool has been tested with IMDB data sets and microarray bicluster analysis. Overlapper has also won the 1st place in the Social Networks category of the 2007 Graph Drawing Contest (15th International Symposium on Graph Drawing).